James “Hondo” Geurts, Assistant Secretary of the Navy for Research, Development and Acquisition, speaks to industry and government representatives about his priorities for aligning the Navy with the National Defense Strategy. 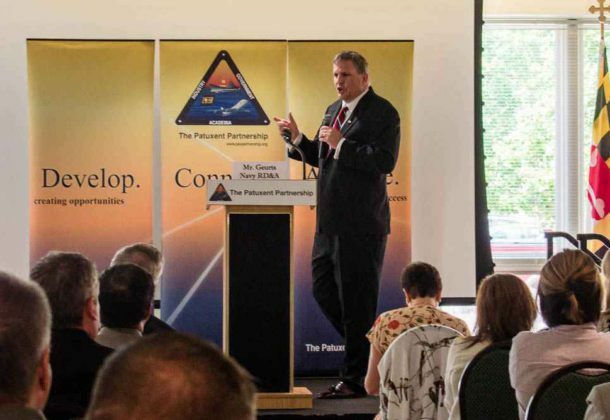 That’s how James “Hondo” Geurts, the Assistant Secretary of the Navy for Research, Development & Acquisition, summarized the current National Defense Strategy (NDS) for small business representatives at a program held by The Patuxent Partnership and the NAVAIR Office of Small Business Programs in September. With over 30 years of joint acquisition experience and having served in all levels of acquisition leadership, his career includes a brief stint with private industry which he credits with widening his perspective on how and where government acquisition and contracting bogs down. Mr. Geurts has said that among his top objectives is developing more agile processes in acquisition. He looks to accomplish this by adopting startup concepts, achieving innovation at scale through decentralization. His first priority is delivery to sailors and marines, acknowledging that this does not mean everything has to be fielded; improved processes and ways of doing business are fair game, provided they result in outcomes for the warfighter. A second priority is agility. Mr. Geurts stated he is “massively decentralizing,” to move decision making as far as possible down the command chain to give command leaders more freedom for inventiveness and critical thinking – to think and act like small business. “Small business is an incredible enabler for agility and pivot speed,” he said. An increasingly familiar refrain, Mr. Geurts wants leaders at all levels to take risks that help them figure out how to work quicker. Mr. Geurts encourages his own personnel to “learn fast” by taking on at least one major initiative every year that has a 50 percent chance of failure, and includes it in their performance goals. Dialogue would go a long way, he contended. “We need to figure out how to get that communication working better without sacrificing transparency and credibility,” he said. Mr. Geurts also made clear that he sees it as his job to help clear the way for better communication, fast learning, and new solutions that benefit the warfighter, but that he needs feedback from industry and government to make it happen.